As much as New York, Los Angeles, Chicago, or Prague, London is one of the most popular places in the world to film a motion picture. Of course, it certainly has plenty of iconic locations that can be used for anything from simple establishing shots to major plot settings. With all of these locations, it makes sense that you see many of the same places over and over. While this is not an exhaustive list of London’s most filmed locations, here are five of best. Let us know your favourites in the comments. The Royal Naval College in Greenwich was founded in 1873 to be the primary training school for naval officers and saw continued use from its inception until 1998. Even before that, the Christopher Wren designed buildings were originally built as the Greenwich Hospital for disabled sailors that operated from 1712 to 1869. Since 1998, it has been open to the public and is a major tourist site, as befitting its status as a Grade I listed building and a UNESCO World Heritage Site. The architectural beauty and historical significance has also attracted a number of film productions. Most recently, an alien ship piloted by Christopher Eccleston landed between King Charles Court and Queen Anne Court buildings to do battle with Chris Hemsworth’s Thor. Johnny Depp as Captain Jack Sparrow was dragged through the Painted Hall. The grounds doubled for Paris in Les Miserables, while King William Court was visited by Robert Downey Jr.’s Sherlock Holmes and Christian Bale’s Batman enjoyed his retirement from crimefighting at Queen Mary’s Court. And these are only the tip of the iceberg. Once the site of the King’s Mews from the time of Edward I until the early 18th Century, Trafalgar Square was constructed into a public space to honour the victor of Lord Nelson at the Battle of Trafalgar. As such, at the centre of the square is Nelson’s column, adorned with a statue of Lord Nelson on the top and four lions at its base. The addition of the National Gallery building in 1838 and prominent location of St. Martin-in the-Fields Church today makes it a top tourist—and filming—destination. The first film ever shot there was London’s Trafalgar Square in 1890. Television programmes such as Doctor Who and Sherlock have both filmed there, as well as the American programme 24. A VE Day celebration provided a memorable moment in Captain America: The First Avenger, while other films that have spotlighted Trafalgar Square include Edge of Tomorrow, V for Vendetta, Love Actually, 28 Days Later, Children of Men, and more. Several Bollywood movies have also filmed here. The first of its kind in the world, the separate railways that would eventually make up the unified London Underground have not only become a major transportation tool for Londoners, but also a primary location for filming. The first film made here occurred nearly fifty years after the Tube opened and was appropriately called Underground. 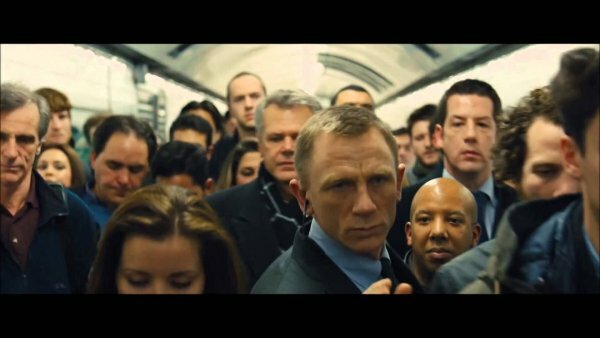 Today, two of the most popular stations for filming are Aldwych, which was closed in 1998, and parts of Charing Cross station that were closed in 1999, with the former used more for films with an older time setting while Charing Cross is often featured in newer films. Additionally, Quartermass discovered alien ships in the Hobbs End station in Quartermass and the Pit, Tottenham Court was one of the sites of the titular monster’s attacks in An American Werewolf in London, Thor had to use the Tube to find his way back to the battle in Thor: the Dark World, and a major chase sequence on the Tube lines featured in the James Bond movie Skyfall. In one instance, when denied the ability to film Doctor Who, that programme built its own set that was so realistic, the Underground thought that the BBC had done the filming without permission. As with Trafalgar Square, Piccadilly Circus has been a major public attraction for centuries and was a major thoroughfare for foot, horse, and eventually automotive traffic. Once known for its bright neon signs, the first advertising to go up there was for Perrier in 1908, though now there are only six of the larger signs permitted. Additionally, the area also features the Shaftesbury Memorial with its statue of Eros, the London Pavilion, the Criterion theatre, and several retail shops and restaurants. As a film location, Piccadilly Circus is often used for an establishing shot of London, as it was in the first episode of the revived Doctor Who. Additionally, films such as The Fast and the Furious 6, Passport to Pimlico, 28 Days Later, Austin Powers, Harry Potter and the Deathly Hallows, Part 1, and plenty more have utilised Piccadilly Circus to show London in its grandeur and activity. The Palace of Westminster has been a feature in London since the original royal palace of Edward the Confessor, while Charles Barry’s Gothic-style building has been the seat of Parliament since the mid-19th Century. Nearby, Westminster Bridge was completed in 1750 and the current bridge, designed by Thomas Page, opened in 1862. 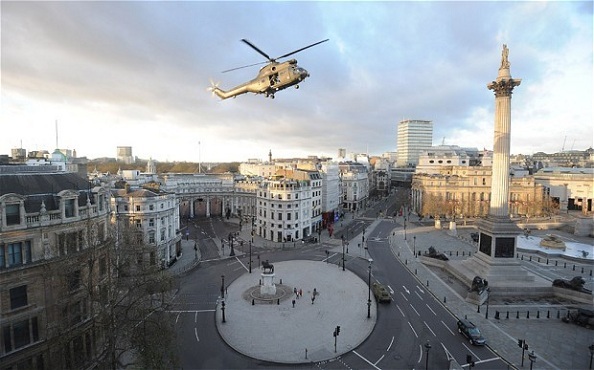 Nearly any film or television programme that involves the government will feature it and it is one of the most popular locations for an establishing shot due to the iconic Elizabeth Tower, often incorrectly identified as Big Ben (which is the tower’s bell). As with Piccadilly Circus, it made an appearance in the 2005 premiere of the Doctor Who episode “Rose”, though its most famous sequence in the programme’s history was during “The Dalek Invasion of Earth”. 28 Days Later used to bridge and Parliament to establish London’s desolation after the zombie outbreak. 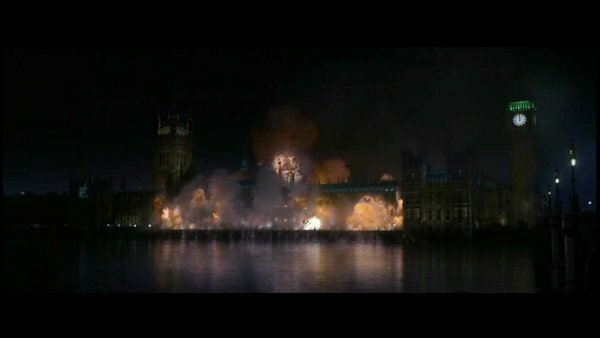 Anarchist V blew up the palace in V for Vendetta, while a reimagined Ernst Stavro Blofeld crashed his helicopter on the bridge prior to his final confrontation with James Bond. Whenever you see London in television and film, you will almost always see the Palace of Westminster and Westminster Bridge.